The Class of 2017 in the Long Beach Unified School District earned $94.4 million in scholarships and grants. The total is a five-fold increase since a decade ago, and just shy of the record $96 million earned in 2015. Many students earned full-ride scholarships to some of the nation’s most prestigious colleges and universities. Poly High School students earned $32.6 million. More than 100 universities accepted Poly seniors, including all University of California campuses. Top school acceptances included Harvard, Yale, Cornell, Notre Dame, West Point, Air Force Academy, Naval Academy, USC, Johns Hopkins, Georgetown, Reed College, Smith College, NYU, University of Pennsylvania, Barnard College, Scripps and Williams College. Wilson High School students earned $19.9 million. School acceptances included Stanford (2), UCLA (27), UC Berkeley (17) and all other UC campuses, plus Georgetown, Cornell, University of Pennsylvania, Purdue, James Madison University, Spelman, Fordham, Howard, Syracuse, Chapman, Pepperdine, University of Washington, University of Hawaii, Villanova, Xavier and University of Illinois. Lakewood High School students earned $14.2 million. School acceptances included multiple UC and California State University campuses, plus Stanford, Johns Hopkins, USC, Swarthmore, Boston University, Boston College, NYU, Seton Hall, Fordham, Hamilton, Baylor, Penn State, University of Connecticut, Georgia Institute of Technology, DePaul, Loyola University of Chicago, Butler, Bentley, Spelman, Syracuse, Temple, George Washington University, Pomona College, Loyola Marymount, Chapman, Pepperdine, Lewis and Clark, Ohio State, Stony Brook, Tuskegee, Clark Atlanta, University of Hawaii, Oregon State, University of Oregon, Willamette, Brigham Young, University of Washington, Washington State, Howard, Whittier College, Mount St. Mary’s, University of La Verne, Biola, Azusa Pacific, California Baptist and California Lutheran. Millikan High School students earned $11.9 million. School acceptances included most UC and CSU campuses plus Johns Hopkins, Boston College, Pitzer, Northwestern, Penn State, USC, Georgetown, University of Wisconsin, St. Olaf, Baylor, Xavier, Emory, Columbia College Chicago, Chapman, Biola, Cal Lutheran, Loyola Marymount, California Baptist, Azusa Pacific, University of Redlands, Hope International, Mount St. Mary’s, University of La Verne, Pepperdine, Southwestern, Spelman, Seton Hall, Arizona State, University of Oregon, Fordham, Washington State, University of Montana, Western State Colorado University, University of Colorado Boulder, Simpson University, Colorado School of Mines, Texas State, Berklee College of Music, Salem State, University of Idaho, Sierra Nevada College, North Carolina University, Dillard University, Fisk University, Lincoln University, Bethune Cookman University and University of Alabama. California Academy of Mathematics and Science students earned $8.6 million. School acceptances included all UC campuses, California Institute of Technology, Massachusetts Institute of Technology, Amherst, Boston University, Bowdoin College, Bucknell, Brown, Carnegie Mellon, Columbia, Cornell, Emory, Georgia Tech, Johns Hopkins, Northwestern, Olin College of Engineering, Pomona College, Purdue, Reed, Rensselaer Polytechnic Institute, Spelman, Swarthmore, Tulane, University of Pennsylvania, USC, Middlebury College, Pepperdine, Claremont McKenna, Dillard, Loyola Marymount and Worcester Polytechnic Institute. Jordan High School students earned $2 million. School acceptances included multiple UC and CSU campuses, plus a full ride scholarship to Pine Manor University and two full-ride scholarships (earned by twins) to Wiley University in Marshall, TX. 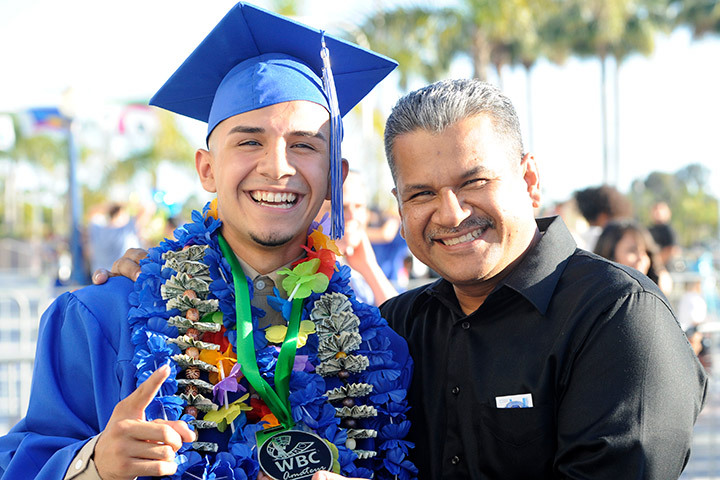 Cabrillo High School students earned $2 million. School acceptances included multiple UC and CSU campuses, plus Stanford, USC, Grand Canyon University, Langton University of Oklahoma, University of LaVerne, San Francisco School for the Arts, Syracuse, University of Great Falls, Humboldt State, Alabama A&M, Texas Southern, Otis College of Arts and Design, University of Antelope Valley, Northeastern and Whittier College. McBride High School students earned $1.6 million. School acceptances included multiple UC and CSU campuses, BYU Idaho, College of the Redwoods, Grand Canyon, Hope International, Northern Arizona, University of Hawaii, University of Puget Sound and the U.S. Coast Guard Academy. Renaissance High School for the Arts students earned $680,000. School acceptances included L.A. Film School, Otis College of Art and Design, Azusa Pacific, Gordon College, UC Santa Cruz, UC Santa Barbara, Cal State Long Beach, Lutheran University, Hobart and William Smith, AMDA and Arizona State. Avalon High School students earned $657,617, while students at Educational Partnership High School earned $170,000, and students at Beach High School earned $28,710. MCBRIDE PRIDE – McBride High School's first-ever class of graduating seniors earned more than $1.6 million in scholarships and grants.